Denise Mack, TheVitalityLounge.com ~ Keeping (truly) Healthy Living simple, affordable, and FUN! Providing tools for Body, Mind & Spirit… Little steps; BIG Impact! I can’t control how someone else perceives me, but I can choose how I react to their assumptions. I can stop caring what others ‘think’, and laugh it off! I can’t always control when I become ill, but I get to choose how I nurture my body in that moment, and help fuel it back to good health. I can’t choose what others might ‘expect’ from me, but I always get to choose when I participate. I get to say yes when fitting. I also get to say no. I can’t control how something might make me feel, but I get to make the most of my emotions by working through them. I can’t control the weather, but I get to choose whether or not I dance in the rain. I can’t control all of the outcomes, but I get to continue to adjust my course as needed so that my path aligns better with my current values & desires. Expanding on our health and wellness means more than just eating ‘right’, staying active, and getting enough sleep. Yep — we all know those play an important role… But, if we ignore our spiritual selves, and tend only to the physical, we’ll still struggle… Quite a lot, actually. There’s just so much more to our existence than what we can experience on the physical plane! Besides, our spiritual hang-ups actually manifest themselves in a very physical way over time — culminating into many an ailment or disease. We’ve all heard the hype about ‘reducing stress’ as part of a stealthy health regimen. There’s good reason for that. It comes back down to our need as spiritual beings to nurture what we can’t see — but can ultimately feel, deep within. And consistent stress produces inflammation, which in turn impacts all of our body’s internal systems and tissues. But in addition to this — feeling our best — or truly living a life of Vitality — means tending to all of our needs — the physical as well as the metaphysical. I’ve written about letting go in the past, and this has indeed been an ongoing lesson for me personally. I couldn’t get with this notion initially — because it seemed akin to ‘giving up’. Since then, I’ve come to learn that there is a significant difference between not trying, and not forcing. That, my friends, is the key difference between a sense of control, and a sense of direction. Control is only a perception anyway. We like to think we have ‘control’ over our lives, when in actuality — we have very limited, if any, true control. So choosing to let go of control in a healthy way is actually conducive to opening up to the right opportunities that may come along — enabling us to make the most of them. We want to continue to follow the prompting of our hearts, and move in our own direction, but not in a forceful, grasping, or controlling way. We need to remember to be open to the potential that something may or may not be meant for us. Or perhaps it has more to do with timing. The bottom line is — trusting with wild abandon, and believing that it all happens for a reason — and that we’ll be met where we are by the Universe if we trust Uni & follow our heart’s prompting, is elemental to this mindset. Paradoxically, as we develop this trust in ourselves and our Source Energy, we also need to remember not to trust just anything or anyone blindly, all at the same time. It’s about trusting our intuition, our instincts, our internal guideposts along the way. It’s about seeking truths that feed our own inner truths — and making conscious efforts to move in our desired direction — yet moving in tandem with the wind, as opposed to fighting against it. We want to be able to consciously choose our path, and make adjustments to it accordingly…. even if we aren’t sure what the final destination will look like. 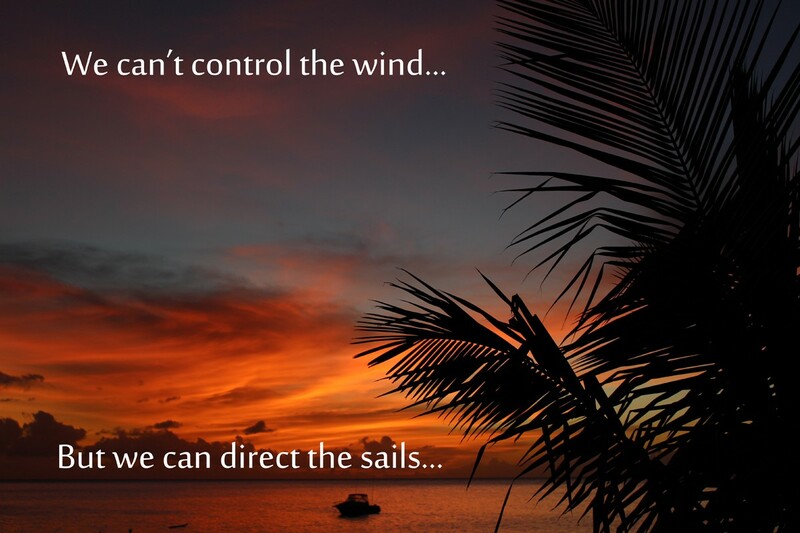 As the famous quote states — we can’t control the wind, but we get to direct the sails. We can compare direction to a musical conductor. The conductor directs the band members, but is not in control over any of their movements or their instruments. When we can relinquish a need for a perceived sense of ‘control’ over a situation, over the actions of others, or even over ourselves — we soften. We become more flexible with the ebb & flow of life. We become more aware, and cognizant of the fact that we are a part of a much bigger picture. With all of our energy flowing and circulating among the other energies of the Universe, the goal isn’t for control anyway. It’s for a symbiotic flow that can benefit all. We’re all here for a reason. We all have a role to play. But we can learn to fully enjoy the growth and expansion we are here to participate in and truly help others with when we make a point to trust more, and attempt to ‘force’ less. We open up to our fullest potential when we can acknowledge where we do not have control, and do our part instead to direct our lives in line with those currents, aligning them with our inner-most desires, ideals, and priorities, and our purpose. It’s not about giving into coercion, or ignoring our hearts. It’s also not about the opposite extreme — of giving up on a dream. It’s about finding that place in between, where we realize that it’s actually much easier and much more fun to let go of the control we never actually had in the first place, while embracing our personal adventures from a place of faith, rather than fear. One of my greatest passions is my ability to truly naturally maintain my overall health and that of my family, all while keeping things simple, affordable & FUN — and sharing that with YOU! I’m not a typical ‘guru’ — and I don’t ascribe to any singular ‘method’ for keeping on track. I’m a ‘regular gal’ — on a mission…. to help everyone realize the value of becoming truly informed [AKA: EMPOWERED!] and learning how to navigate our health — without giving up things we love in the process. Have you checked out my personalized e-courses for making TRULY healthy living a reality for all? What are you waiting for?? There’s so much to gain! Go ahead — and take back YOUR power to thrive! LEARN MORE ABOUT MY CLEAN-LIVING E-COURSES HERE! Originally published at thevitalitylounge.com on April 12, 2017.